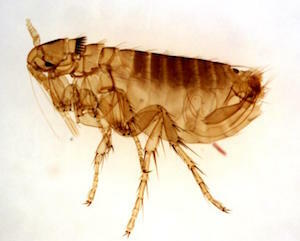 Fleas are small (1/16 to 1/8-inch (1.5 to 3.3 mm) long), agile, usually dark coloured (e.g. the reddish-brown of the cat flea), wingless insects with tube-like mouthparts adapted to feeding on the blood of their hosts. Their bodies are laterally compressed, (i.e., flattened side to side) permitting easy movement through the hairs (or feathers etc.) on the host's body. Their legs are long, the hind pair well adapted for jumping (vertically up to seven inches (18 cm); horizontally thirteen inches (33 cm)) - around 200 times their own body length. The flea body is hard, polished, and covered with many hairs and short spines directed backward, allowing the flea a smooth passage through the hairs of its host. Although some fleas (like the human flea) have less hair owing to there being less hair on the human. Its tough body is able to withstand great pressure, probably an adaptation to survive scratching, etc. Even hard squeezing between the fingers is often insufficient to kill the flea; it may be necessary to crush them between the fingernails. Fleas lay tiny white oval eggs. Their larvae are small and pale with bristles covering their worm-like bodies. They are without eyes, and have mouthparts adapted to chewing. While the adult flea's diet consists solely of blood, their larvae feed on various organic matter including the faeces of mature fleas. In the pupae phase the larvae are enclosed in a silken, debris-covered cocoon.